[Erich] is the middle of building a new competition sumo bot for 2018. He’s trying to make this one as open and low-cost as humanly possible. So far it’s going pretty well, and the quest to make DIY parts has presented fodder for how-to posts along the way. One of new bot’s features will be magnetic position encoders for the wheels. In the past, [Erich] has used the encoder disks that Pololu sells without issue. At 69¢ each, they don’t exactly break the bank, either. But shipping outside the US is prohibitively high, so he decided to try making his own disks with a 3D printer and the smallest neodymium magnets on Earth. The pre-fab encoder disks don’t have individual magnets—they’re just a puck of magnetic slurry that gets its polarity on the assembly line. 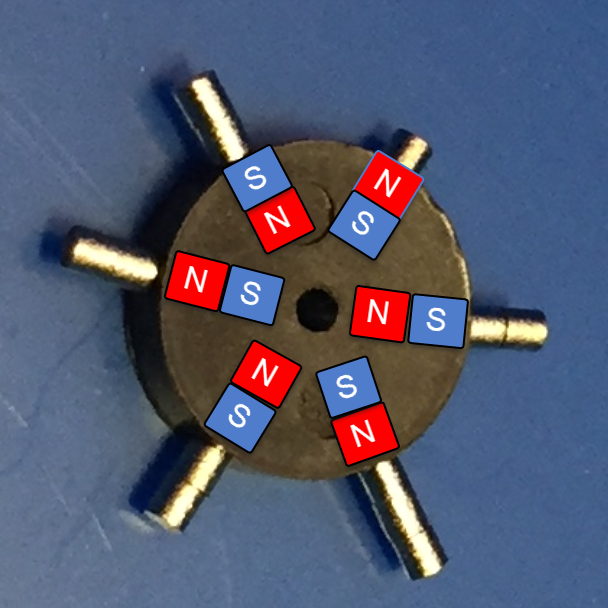 [Erich] reverse-engineered a disk and found the polarity using magnets (natch). Then got to work designing a replacement with cavities to hold six 1mm x 1mm x 1mm neodymium magnets and printed it out. After that, he just had to glue them in place, matching the polarity of the original disk. We love the ingenuity of this project, especially the pair of tweezers he printed to pick and place the magnets. Rotary encoders are pretty common in robotics applications to detect and measure wheel movement. Don’t quite recall how they work? We’ll help you get those wheels turning. LVBots, a club for robot building enthusiasts in Las Vegas, held an open house the week of CES. This was the only trip [Sophi] and I took away from the conference halls of The Strip and it was a blast! The group holds meetings twice a month in a space provided by Pololu — a well-known robotics and electronics manufacturer headquartered just south of McCarran International Airport. Before the formal part of the gathering started there were several builds being shown off. [Claire] and [Brian] recently participated in an AT&T sponsored hackathon. Their creation is a robotic closet. The system involves moving racks of clothing which are tracked by a smartphone app. Interesting features discussed for the software include monitoring when each garment was last worn, last washed, and if it is appropriate for current weather conditions. Dig into the code in their repo. In other parts of the room a pair of line-following robots did their thing, and a couple of sumo-bots competed to push each other out of the ring. A large group was gathered around the projector watching videos of robots of all types, brainstorming about the difficult parts, how they were overcome, and how these methods may be applied to their own build. I can attest that hanging with a group of people who are trying to cue up the most amazing robot demonstrations makes for amazing viewing! [Nathan Bryant] was one of the two robot builders trying out the challenge on this night. He built this hexapod from balsa wood and three servo motors and was testing Phase 1. The bot includes a sensor dangling out in front of the robot to detect then the table surface is no long below. At that point it backs up a few steps, turns in place, and proceeds in the opposite direction. [Nathan] mentions that he worked out all the movements in a spreadsheet and that future firmware upgrades will dramatically increase the speed at which the bot moves. We love the audible cadence of the bot which is easily observed in the video above. At one point a leg dangles over the edge and it looks like [Nathan] pushed the bot back but I don’t remember him actually touching it so I’m calling this a trick of camera angle. One phase further in the Tabletop Challenge is [Joe Carson]. He exhibited a wheeled robot he’s been working on that includes a gripper arm on the front. The robot looks around the table for a predefined color, in this case provided by a highlighting marker. When found the bot approaches, grips, and then proceeds to move the marker over the void where it is dropped out of existence; at least from the robot’s point of view. Opensource RhinoBOT is Well Suited For Hacking and Sumo-Robotics! The RhinoBOT is an open source and 3D printed robot that is fun to build and easy to expand. It can be used for educational purposes or even as a sumobot! [Miguel Carro] runs a DIY robotics blog at bq.com (Spanish — Translated) to help teach kids about robotics using a fun cartoon character named Andy. He’s released all the design files for his latest printbot, the RhinoBOT on thingiverse.com. Using an Arduino UNO, an IR sensor, two rotational servos, an LED, batteries and a few pieces of hardware, you can build your very own RhinoBOT! That is — if you have a 3D printer. The fun doesn’t stop there though, as [Miguel’s] also created a phone app to let you control your RhinoBOT wirelessly! And since not all the outputs on the UNO are used, y0u can add extra functionality with a bit of creativity — how about being able to move that dozer! To see what it can do, and to start thinking about what you could do with it, stick around after the break to see it in action!